Singer-songwriter Ed Sheeran recently stopped performing "Perfect" during one of his shows to let a guy propose to his girlfriend. And if that wasn't enough to make us adorably fall in love him, he's got more good news for us! In a recent interview, Ed was asked to respond to ~rhetorical~ tweets sent in by fans. One of the tweets said, "I want BTS x Ed Sheeran but when will they ever." Well, news flash! It's a real possibility! Ed replied, "I actually wrote a song that I think they might be messing with. I heard this the other day. I don't know. I really like BTS though, I think they're great." 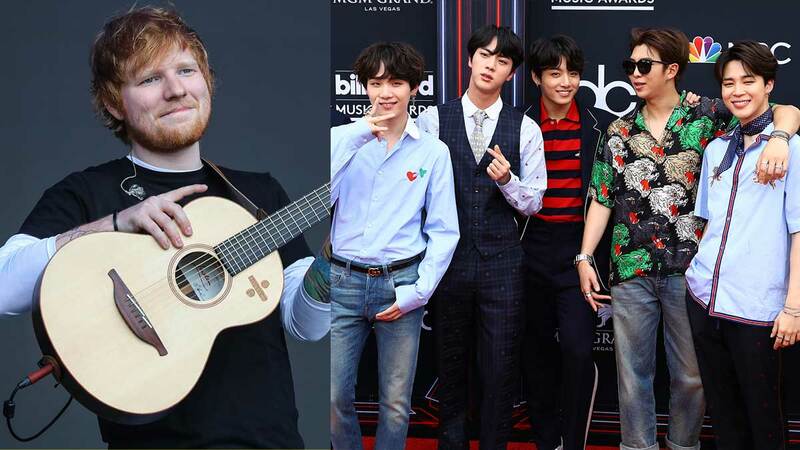 Though there's no word from BTS and their team about a potential collab with Ed, it wouldn't be the first time the seven-member group worked with a popular British songwriter. Conor Maynard co-wrote the track "Answer: Love Myself" on BTS' chart-topping album Love Yourself: Answer. They've also collaborated with Steve Aoki ("Waste It On Me")and Nicki Minaj ("IDOL")! This is also not the first time that Ed talked about the K-pop group! Back in August, Ed posted on Instagram Stories to congratulate BTS on their successful comeback with "IDOL" and their album Love Yourself: Answer. He wrote, "Congrats to BTS who are about to have an incredible week. Cool album."